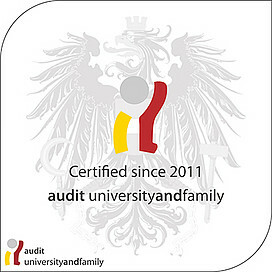 The provisions of the University Work-Family Balance Information Centre have made the University of Graz into a prominent role model: The centre provides advice and service to support you in combining studying/working with actively caring for children, teens, adult or elderly family members. In 2007 and 2011, the largest educational institution in the province was awarded the prize for "most women and family-friendly public enterprise in Styria" in the category "public enterprises" in recognition of its involvement in this area. Vice Rector Renate Dworczak received the 2012 Woman Award for the family-friendly initiatives at the University of Graz. unikid provides advice and service to make studying/working and caring for minor family members more compatible. Provisions range from need-based and year-round childcare to childcare in the summer, "unikid-Info" for parents of adolescents, unikid courses and confidential research of individual situations. unicare provides advice and service around the topic of family care, basing provisions on a scientific study on the frame conditions of family care responsibilities at the University of Graz. Provisions range from "unicare-Info" for family carers to information brochures and confidential research of individual situations in order to answer questions about how to combine studying/working with actively caring for adult and elderly family members. As a cooperation partnership between all universities in Graz, the KinderUniGraz offers a portfolio comprising events on science and research for school classes, families, children and young people from 8 to 19.